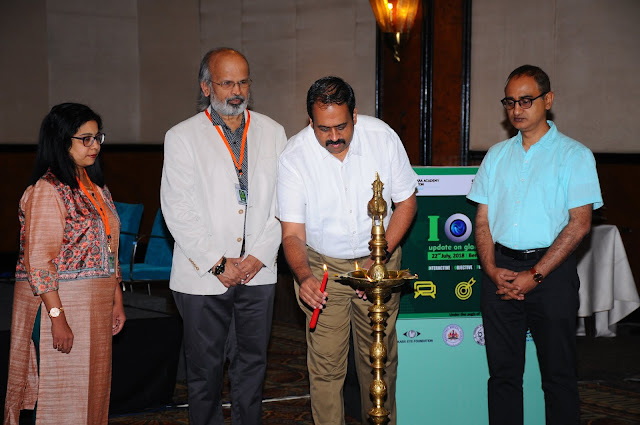 Bengaluru, July 24, 2018: Sankara Eye Hospital, the leading provider of quality eye care in the country organized “Update on Glaucoma’ – a one-day Interactive, Objective and Pragmatic session” which witnessed participation from Renowned International doctors. The one-day event aimed at providing a platform to interact and learn from the stalwarts in the field regarding concepts, preferred current practices and recent advances in the field of Glaucoma. The session provided practical information regarding concepts, diagnosis, surgical tips and management of Glaucoma Patients in an interactive way to all the practicing ophthalmologists and upcoming postgraduate students who attended the event. Some of the interesting topics include OCT Angiography, CO2 assisted –laser sclerotomy, Minimally Invasive Glaucoma Surgery, Newer drugs, and drug delivery system in Glaucoma, Surgical management of congenital Glaucoma along with Dry eyes and Glaucoma. “We are overwhelmed with the response received for the event. The team of glaucoma & Ocular Centre for Excellence at Sankara Eye Hospital has dedicated and qualified consultants who are experts in providing treatment and quality eye care from simple dry eyes to complex glaucoma cases. The session has enlightened us about various unexplored aspects of Glaucoma treatment and recent technology advancements in the field”, said Dr. Meena G Gopinath, Ophthalmologist, and Glaucoma specialist, Sankara Eye Hospital, Bangalore. Dr. Dilruwani Aryasingha from Singapore and Dr. Shamira Perera from Singapore spoke on various developments in technology enhancing simpler Surgical procedure. Management of cataract in Glaucoma patients too was discussed making this a highly successful event.